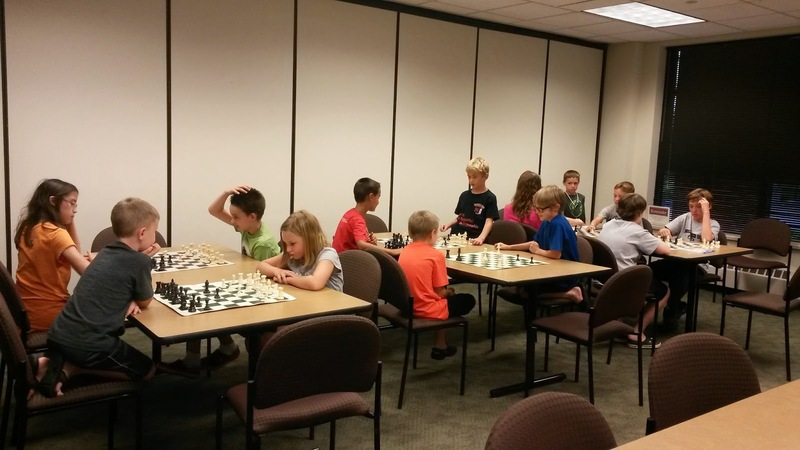 Tonight was the last Open chess class for the summer & it was very well attended. Thank you to all that came through the summer. Just a reminder that this Wednesday, July 30 will be the last Open Chess at the Library. Please come & have some fun. Also on Friday August 1, we'll be at Jammin (same place before, library's parking lot). Please come & help get the word out about the Chess Club. If you do come, please also bring chairs. 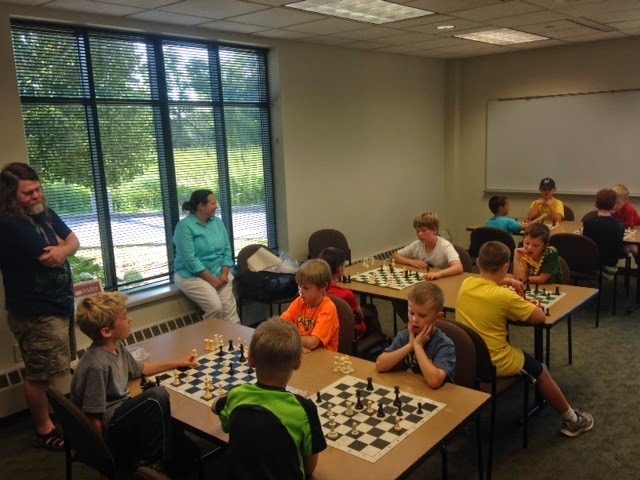 Chess club night at the Muskego Library - full house! Many from the MSCC attended and a couple of new faces as well, was a fun night. Don't forget - next week Wednesday the 30th is the last night, and be sure to visit MSCC in the library parking lot Friday the 1st for Jammin' on Janesville ! If anyone's interested in attending this tournament, please let me know at leahmike@ymail.com. We can register as a club & save $5. If you slowly want to get back into playing tournaments before the chess season starts, there's one close to home. Country Inn & Suites Brookfield, 1250 South Moorland Rd., Brookfield, WI 53005, (262)782-1400. All Sections, TC: G/60 d5. Rds. : 10-1-3:30-6. EF: Open: $35 by 8-14, $40 after 8-14, Reserve (U1600) & RBO (U1000). Non Rated K-12 and Non Rated Adults $25 by 8-14, after 8-14 $30. $$Guarant...eed! : Open: 1st $300 - 2nd $175 - A $110 - U1800 $110. Reserve (U1600): 1st $100- 2nd $75. RBO (U1000): 1st $100 - 2nd $75. Both Non rated sections are book prizes. Reg. : Aug 16th 8:30 - 9:30. Entries to: ( make payable to Benzochess) Ben Corcoran, 2711 N. University Dr. #64, Waukesha, WI 53188. Q&A: Ask for Ben 262-506-4203 or benzochess@gmail.com also more info at www.benzochess.com. If you're interested in attending, please let me know at leahmike@ymail.com. I'll register as a club. Thank you. Just a reminder that we'll be at Jammin again on August 1 in the same location. If you're able to help out, please shoot me an e-mail at leahmike@ymail.com. Hello all- having an OPEN CHESS PLAY at the library tonight - hope you can make it! This will continue Wed eve's thru the 30th of July! NO CHESS AT LIBRARY tonight - we will resume next wed 7/9 at 6:30 ! !